Efest 18350 is small but packed with full 700mAh power. It is tiny battery with lot of grunt to fire. Above all, Efest is worlds top selling battery in Lithium Ion Manganese Oxide Battery (IMR) . 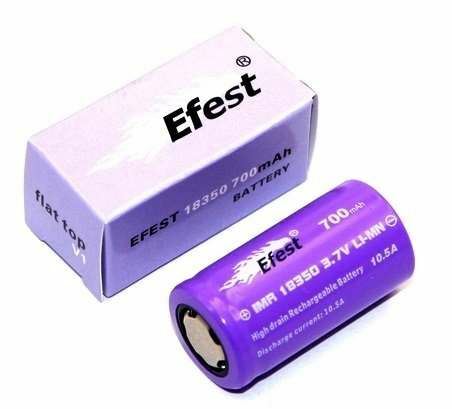 Efest 18350 Battery measures 18.25mm wide diameter and 34.3mm length. This is rechargeable battery suitable for various mod including Innokin Cool Fire 2, VTR, Vamo V5, Vamo V6 etc. - Fully charge before first use. - Never short (connect positive, and negative side) battery. - Keep them always in battery case, or any other insulating material. - Never keep this battery together with metal objects (short circuit can happen if you do). - Never carry bare cell in your pocket with keys, change or any other metal objects.